Riders found out today that an Uber loyalty program has gone live in San Francisco and other locations in the US. The program tallies how much you spent on Uber and Uber Eats in the past six months and rewards you accordingly. The program has different tiers of rewards. These rewards include no-fee cancellations if you rebook, guaranteed prices between your two favorite spots, and free car upgrades. Uber confirmed to TechCrunch that Rewards will roll out to the entire US soon, but is now available in 25 locations across the country. This is a clever tactic by Uber and will increase the chances of passengers using company instead of rivals like Lyft, even if the ETA is too long or prices are too high for a ride. Uber has gained the upper hand over Lyft. Even though Lyft announced its own loyalty program just two days before Uber made its own announcement, so far we haven’t seen any more news about when it will roll out. Uber launched its loyalty reward service on November 14th of last year. The company planned to initially launch in nine cities including Miami, Denver, Tampa, New York, Washington DC, Philadelphia, Atlanta, San Diego, and New Jersey. Now it is launching its program all across the US. Uber Rewards is now available in Boston, Dallas, Orange County, Houston, New Orleans, Kansas City, Indianapolis, LA, San Francisco, Fort Collins, the Rockies, Pittsburgh, Lehigh Valley, Gettysburg, Erie, and throughout western Massachusetts. Uber wasn’t the first company to launch a loyalty program. Southeast Asia’s Grab has had a loyalty points system since 2016. But Uber has far more reach and more investment than Grab. Using Uber’s loyalty points is pretty straightforward as everything happens automatically. You just have to keep a look out for the invitation to join and activate it. Once you have done that, you will see your tier and the associated perks in the app. Regardless of tier, everyone will get a $5 rebate for every 500 loyalty points earned. Riders earn 1 point per dollar spent on UberPool, Express Pool, and Uber Eats; 2 points on UberX, Uber XL, and Uber Select; and 3 points on Uber Black and Black SUV. 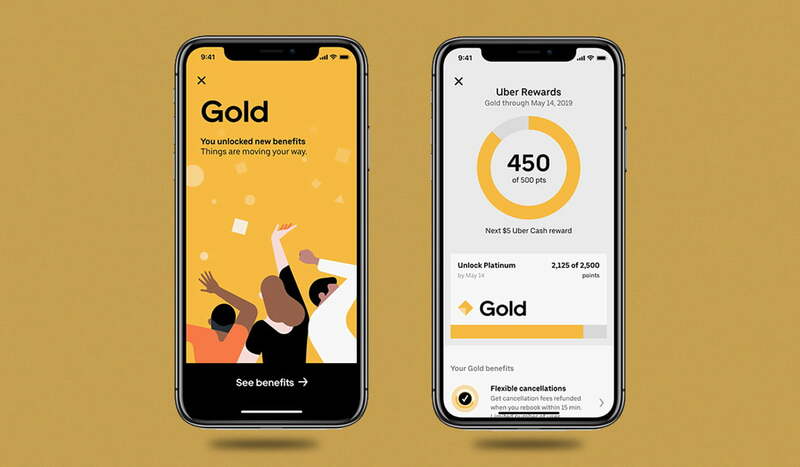 Uber is offering four tiers to its customers: Blue, Gold, Platinum, and Diamond unlocked at 0, 500, 2500, and 7500 loyalty points, respectively. Gold-tier members will have all the rewards offered in the Blue tier plus flexible cancellation and priority support. Flexible cancellations mean you get a refund on your $5 cancellation fee if you rebook within 15 minutes. Priority support is for users who occasionally take Uber but usually choose more economical options. The Platinum tier gets you the Gold benefits plus price protection. Peak factor protection will allow users to choose the route they take most frequently and it will not be affected by peak factor charges. So, for example, users could choose their work-to-home route and not pay extra during rush hour. Platinum members also get priority pickups at airports. The Diamond Tier is Uber’s highest reward tier. It has all the benefits of the Platinum tier plus premium support with a dedicated phone line and fast 24/7 responses from Uber’s highest-rated customer service representatives. Users will receive complimentary upgrade surprises from UberX to Uber Black and other high-end cars and will be provided with Uber’s highest-rated drivers. They will also get free delivery on three Uber Eats orders every six months. Uber Reward program is a brilliant strategy to keep its users loyal.